The Holy Family Association is an official gathering of Christian families whose purpose is to promote the imitation and devotion of the Holy Family. The Association proclaims the Holy Family as the model of all Christian families, and takes its inspiration from the Gospel of the Holy Family, which is summed up in Saint Joseph Manyanet’s motto: "A Nazareth in each Home." Disciples of Nazareth: by welcoming into their homes the Holy Family as the model for their life-project. Witnesses of Nazareth: by adopting the values present in the Holy Family. Apostles of Nazareth: by proclaiming through word and deed these values to other families. The person consecrated to the Holy Family, takes part in a community of Disciples of Nazareth who listen to, reflect upon and enliven the Word of God revealed Itself in the family life of Jesus, Mary and Joseph. They read and share the Scriptures as a way of deepening their faith, witnessing to it, and living it in a more authentic manner. The Association provides its members with an ongoing doctrinal, spiritual, and moral program of formation, fulfilling this task when and wherever possible or facilitating its implementation through other institutions. Each member commits to form a family of witnesses of Nazareth, supporting one another in personal development and ongoing sanctification and making God present in the home and work place. All members commit to defend life from conception until natural death; to encourage the practice of adoption and collaborate in providing assistance to children who have been abandoned by their parents or have lost them. Each member tries to carry out works of mercy toward the poor, the sick, the elderly, the handicapped, orphans, widows, abandoned spouses, and unmarried mothers. Thus, each member is called to take part in a community of Apostles of Nazareth. Family members endeavor to make of their own family a true community of life and love. Married members involve themselves in preparing young people for marriage and are at the side of couples experiencing moments of crisis to support them with their own expertise and with the means that a caring Church offers. Consecration to the Holy Family is accomplished by reciting in public the approved formula in the presence of the pastor or properly designated priest. The names of the consecrated family member are inscribed in the Association’s record book. The National Council will issue a corresponding certificate of membership. Consecration will be an annual event. All members frequently gather around a displayed statue or picture of the Holy Family. Married couples renew their marriage vows before the image of the Holy Family. A unique means by which the members of the Association might bind themselves together and to the Holy Family is the Monthly Home Visit. The Holy Family little shrine goes from one home to another among the members of the Association. - Feast of the Holy Family (the Sunday after Christmas). - Feast of the Immaculate Conception (8 December). - Feast of Saint Joseph (19 March). 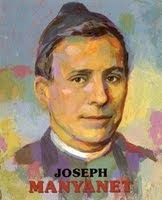 - Feast of Saint Joseph Manyanet (16 December). On the feast of the Holy Family all members renew their consecration to the Holy Family. All member families will observe wedding anniversaries and other family celebrations as opportunities to offer God praise and thanks. Members of the Association find inspiration, direction and assistance from the religious Institute of the Sons of the Holy Family. 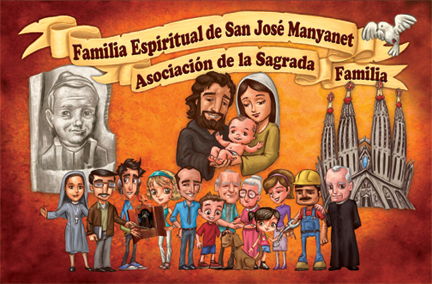 They unite themselves with these professed religious becoming a part of Saint Joseph Manyanet’s religious family. Every Wednesday the Association’s spiritual advisers and the associates, celebrate the Eucharist for the family. On the last Wednesday of each month the Mass is offered for the eternal repose of the Association’s deceased members. 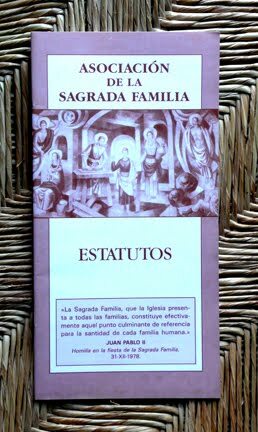 The Holy Family Association, as a group of families for the sake of families, remains under the direction of the families themselves and a priest adviser. The Association promotes its goals by means of periodic meetings and encounters with the families in small groups, assemblies, and congresses. The Association is structured at parochial, diocesan, national, and worldwide levels through the establishment of directional councils on each level. The couples making up these councils each have one vote per individual on all issues to be decided by ballot. All members elect three couples who form the Parochial Council, which is to promote and implement the Association’s goals, always in consultation with the pastor or the priest designated as the parochial spiritual adviser of the Association. In each diocese there exists a Diocesan Council, which is to promote and implement the Association’s goals throughout the diocese. This council is formed by three couples and a priest, who is presented to the bishop by the Association’s secretary general. The couples are elected from among the members forming the parochial councils. The Diocesan Councils are unified and coordinated by a National Council, which heads the Association and implements its goals within a given country. The National Council is formed by three couples and a priest properly designated as the Association’s national spiritual adviser, who is appointed by the Association’s secretary general. The three couples are elected from among the members forming the Diocesan Councils. The National Councils are subordinate to a Worldwide Council, which oversees the Association’s promotion and implementation of its goals on a worldwide basis. This council, presided over by the Superior General of the religious Institute, Sons of the Holy Family, Jesus, Mary and Joseph, is also formed by three couples and a priest. The three couples are elected from among the members forming the National Councils. The Association’s Worldwide Council and International Spiritual Center have their Headquarters in Rome, Italy, at the Parochial Temple of the Holy Family of Nazareth, established by the wish of Pope Pius XII to be a "bright beacon and most solid foundation of the devotion to the Holy Family of Nazareth." The Worldwide Council solicits from other Institutes and Congregations bearing the title of "Holy Family," support, encouragement and spiritual assistance to its members. The Association carries out concrete programs and activities with such Institutes and Congregations in line with the Association’s objectives and spirituality of the Institutes and Congregations themselves. The Holy Family Association is compatible with other parish movements and organizations, since its purpose is to enlighten the human family on its calling and mission in the Church and the world from the spiritual viewpoint of the Family of Nazareth. The Association’s Worldwide and National Councils, as well as the Diocesan and Parochial Councils, employ, each at their respective levels, those means appropriated for promoting the Association and implementing its goals. The Holy Family Magazine is the Association’s official mouth piece for the countries in whose languages it is published. Families, couples and single members help meet the financial burden for promoting and operating the Association by means of a voluntary annual contribution made to their respective Parochial Councils. The diocesan, national and worldwide councils are subsidized by an established quota mutually agreed upon by the councils themselves. All positions of responsibility and spiritual assistance are voluntary and for a three year term that is renewable.